OK this has nothing to do with waiting till marriage, but I just wanted to post it. Most great internet videos make you laugh out loud, or maybe shock you. These videos make you cry. But don’t worry. It’s a happy cry, not a sad cry. This has nothing to do with waiting till marriage, but given that many of you are hopeless romantics to the core (or at least idealists), I figured you might like them. So grab a tissue box, and click play. Note: Embedding has been disabled on this video, so you have to click over to watch it at YouTube. Sorry about that. If anybody has a workaround for this let me know. 3. Little girl is about to tell her class about her dad who’s in Iraq. He comes home early and surprises her. This fourth grader made a video about her dad, the soldier who’s currently fighting in Iraq. The next day, when she’s about to present the video to her class, her dad comes in…home early. OK, maybe I’m just a wimp. But hero stories bust me up. Short and sweet. Damn you, Visa *sniff*, damn you. This is a true story, as told by the real people involved, illustrated by StoryCorps. Stay with it till the end for the waterworks. i guess im just not a sensitive person…. i hope that’s not a bad thing ._. 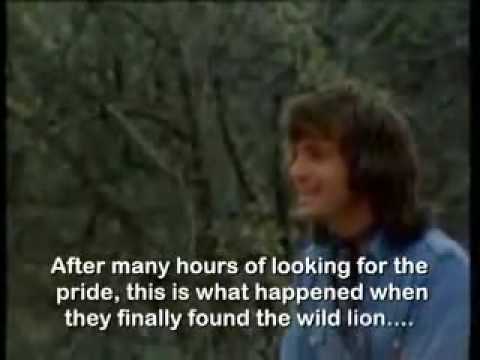 I love Christian the Lion, but I had never seen the other videos. All of them made me cry. I feel so bad for the veteran and the daughter of the Vietnamese soldier killed. I am happy that the daughter could forgive the vet. The story of Dannie and Annie was so cute! That’s true love! It reminded me of the book “Tuesdays with Morrie” by Mitch Albom. I recommend that book for all you softies out there! I absolutely loved these <3 and yes they made me cry, and I'm not a softy either. Thanks for sharing Mike! THIS REMINDS ME OF MY HUSBAND & I. I LOVE IT! The story of Dannie and Annie also of Christian I think are two stories I will never forget. I was sitting on the edge of my sit waiting for them to get bit but no never and they walk away like a big happy family. o, i think i’m going to cry again. Then Dannie and Annie to be blessed to find true love such as theirs is a miracle that everyone longs for. im a stuborn i didnt cry heish!!!!!!!!!!!!!!!!!!!!! You forgot my little dashie. Balled my eyes out when I read that. ok ok I cried! All of those videos were touching in some way! That made me cry so much. Thank you for uploading this! GOTTA LOVE Danny and Annie!!! This guy is HILARIOUS!!! So many great quotes. “Would you please drink for water”? I’m not a big believer in the idea that each of us has one specific “soulmate”, but it sure seems like Danny has met “the one”.